Zombie Hunter Sword Set for sale includes two 27 inch swords and two scabbards. These swords have a 20 inch sharpened black finished stainless steel blade that features the famous toxic biohazard green colored splatter. The black handle is wrapped with green cord. The included black nylon sheath features an adjustable shoulder strap and a rubber patch logo. 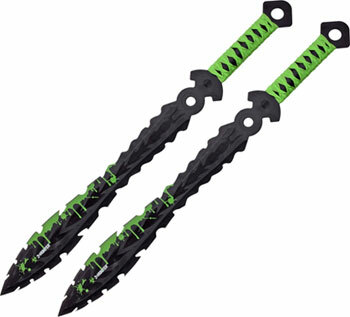 Buy the popular Zombie Hunter Sword Set for $59.99.